ON APRIL 15, 1974, A DEBATE failed to take place at Yale University, even though the speakers were present and the auditorium was full. William Shockley, the Nobel laureate physicist turned eugenicist crank, faced William A. Rusher, the publisher of the leading conservative magazine, National Review. Shockley came to argue that, since black people were intellectually deficient for genetic reasons, the government should support their sterilization. Rusher did not have a problem with Shockley’s racism: “I have no objection to Shockley’s premise,” he wrote. He intended to criticize Shockley only for his misplaced (“liberal”) faith in government’s ability to cure the problem of racial IQ inferiority. Predictably, the students in the audience shouted down both speakers. The university was overwhelmed by negative publicity, and criticized for blocking free speech. The media made much of the students’ rudeness toward Rusher—didn’t they realize that he was there to oppose the racist viewpoint? (The media reaction was evidence of the success of Rusher’s effort—and the laziness of the press.) The whole episode, in short, was a work of conservative-movement performance art that bore Rusher’s characteristic hallmarks: it was media-savvy, cynical, manipulative, embarrassing to the establishment, possessed of a nasty racial edge, and too clever by half. The Shockley brouhaha isn’t mentioned in David B. Frisk’s new biography of Rusher. Like most books about the movement that are blurbed, reviewed, published, and read almost exclusively by conservatives, the biography is generally uncritical of its subject and skirts episodes that might discredit the cause. The book is instead concerned with presenting an engaging portrait of the man who spent most of his life known as “the other Bill,” overshadowed by National Review’s flamboyant editor-in-chief, William F. Buckley, Jr. It also makes the case that Rusher strengthened the conservative movement by providing political intelligence and perspective that Buckley lacked. Yet Frisk’s unwillingness to grapple with the grittier details of Rusher’s career curiously undervalues his subject, for in many ways it was Rusher, not Buckley, who was the founding father of the conservative movement as it currently exists. We have Rusher, not Buckley, to thank for the populist, operationally sophisticated, and occasionally extremist elements that characterize the contemporary movement. Rusher was born in Chicago in 1923, and although he grew up in the New York City area he remained skeptical of the East Coast and its liberal ways for all of his life. Rusher’s parents argued viciously before they divorced, perhaps ruining him for marriage, while also—according to Frisk—teaching him how to win debates by taking advantage of opponents’ weak spots. Rusher mastered his debating skills as an undergraduate at Princeton in the early 1940s, where he acquired another lifelong trait: his resentment of the establishment. Aristocratic swells at pre-war Princeton deemed him an un-clubbable middle-class striver (“black shoe,” in the terminology of the day), instilling a lifelong hatred of liberal elites. Rusher’s introduction to practical politics began in the early 1950s, not long after his graduation from Harvard Law School, when his involvement in the national Young Republican (YR) federation connected him with the strategic genius F. Clifton White. Rusher and White went on to create a political machine that held the YRs in thrall for decades to come. The Syndicate, as the White-Rusher nation-wide network of low-level Republican operatives became known, allowed the two men to extend their influence beyond the YRs to the broader Republican Party—imitating the structure of New York governor Thomas Dewey’s tightly run national Republican network, which helped to deliver the 1952 and 1956 presidential elections to Dewey’s favored candidate, Dwight D. Eisenhower. As Rusher’s anti-Communist feelings intensified and he became increasingly aligned with National Review (which he joined as publisher in 1957), the Syndicate began to siphon off power from the Dewey organization and to turn the party away from Dewey-Eisenhower moderation. White and Rusher masterminded the delegate-hunting operation that led to Barry Goldwater’s seizure of the GOP presidential nomination in 1964, and Syndicate alumni went on to high positions in Republican administrations. Many are still active in party politics today. Scholars, including Frisk, have yet to analyze the Syndicate adequately, mostly because its activities were necessarily sub rosa and directed against moderates inside the GOP rather than Democrats. (Conservatives, by and large, do not write about the movement as impartial scholars, and the internal developments of the Republican Party were out of academic vogue until quite recently.) But the Syndicate provided much of the conservative movement’s ideological content and personnel, as well as its tactics and tone. Many of those tactics were borrowed directly from the Communist Party: manipulation of elections, the creation of front groups, intimidation, slander, agit-prop techniques, and an ends-justify-the-means approach. Rusher was rather proud of his mastery of what he called “the black art of winning conventions” and other political contests, but the darker side of the Syndicate’s influence is still felt today: it provided a template for a movement that knows very much about how to incite resentments and oppose establishments, but very little about how to govern. Frisk averts his gaze from the Syndicate’s unsavory activities and focuses on more pleasant and often quite fascinating matters, such as Rusher’s relations with Buckley, his debates with other National Review colleagues, his extensive travels to anti-Communist bastions, and his connoisseurship in food and wine. Frisk describes Rusher’s generous mentorship of generations of right-wing activists and his indefatigable correspondence with movement participants. Though Rusher achieved some public prominence through his nationally syndicated column “The Conservative Advocate” (published from 1973 to 2009), his speeches, and his appearances on the PBS television show The Advocates during the ’70s, Frisk’s account suggests that his more significant role may have been as a movement nexus and motivator, a sort of Allard Lowenstein of the right. In fact, Rusher was something of a sage, outlining the conservative future in 1963 in his essay “Crossroads for the GOP,” which called for the joining of white Southern populists with traditional-minded economic conservatives—a prophetic glimpse of the Southern Strategy that began under Richard Nixon and has continued to the present day. But he had little confidence in his vision. He was quite skeptical that the Republican Party could ever be converted, and devoted much of his energies to a quixotic quest for a conservative third party. 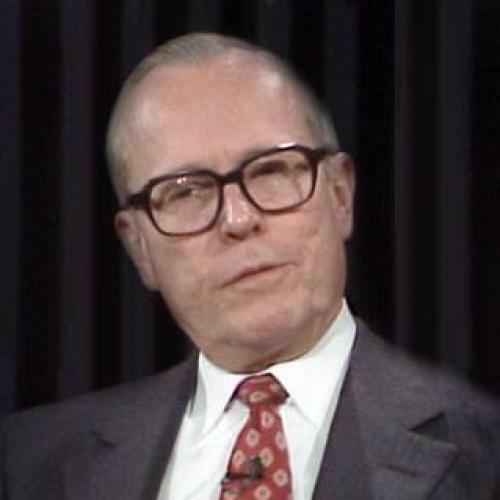 As late as 1979, he called the Republican Party “that putrefying corpse,” and asked a friend, “Do you see the slightest evidence that the GOP is really going anywhere?” Ironically, it is Rusher’s polarizing caricature of an America divided into “producers” and “non-producers” that has lived on in the Tea Partiers today. But Frisk makes a strong case that Rusher was not a mere populist propagandist. Though he was passionately opposed to abortion, for example, he warned pro-lifers that American democracy “requires constant compromise among people who differ passionately.” Still, Rusher was, as he put it (paraphrasing Napoleon), “not very fond of women or games. ... 100 percent a political animal.” Partisan politics colored his whole life, and he apparently had only a single Democratic friend. And he was, ultimately, a hard-shelled conservative warrior. Frisk has contributed a useful but incomplete biography of an important and neglected figure. Rusher’s significance was not his participation in philosophical debates with Buckley and other conservatives so much as his tireless, decades-long work behind the scenes to build the organizational infrastructure that enabled the ideological takeover of the GOP. We still need a book that can shed more light on how that infrastructure was created, why it succeeded, and how it has affected American politics. Buckley was the creator of the conservative movement we might like to have, but Rusher arguably was the creator of the conservative movement we do have. It would behoove even liberals to learn more about him.